I’ve not been keeping up with my blog lately. I hope you haven’t given up on me! There’s been a lot going on, guests to look after and… I’ve signed on to Redbubble! It’s an art and photo sharing site and it is very habit forming. There is a lot of excellent photography and art to browse….you could spend hours. You make friends too and spend time commenting on other peoples’ work and responding to comments on your work. Very absorbing. But back to the art here. I have been distracted from the North Norfolk holiday sketches by the cosmos growing in the garden. When I go up to the studio, past the flower beds, I can take half an hour to get there. Which sounds reasonable until I tell you that my garden is only 60 feet long!! A lot of staring and photographing goes on…and then a bit of flower dead heading, trips to the compost bin and before you know it it’s lunchtime and I never got to the studio! 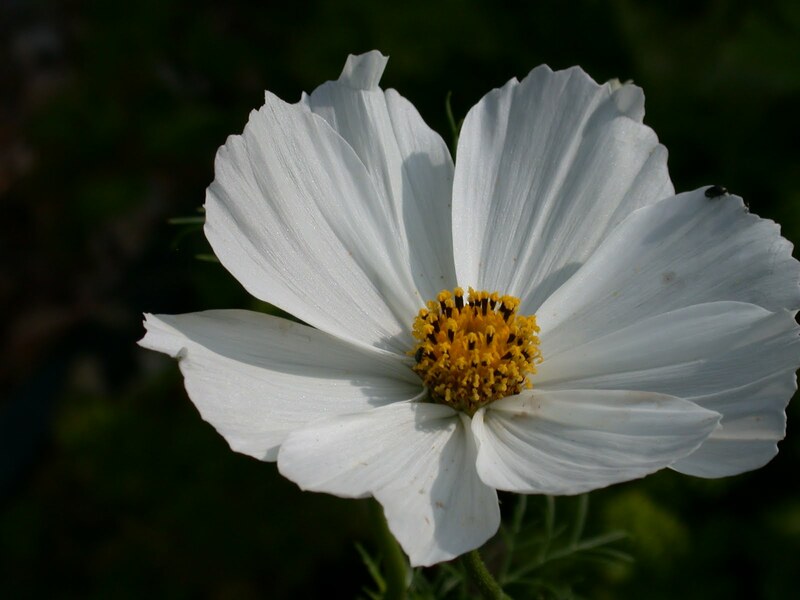 But it’s been the white cosmos that has caught my eye. 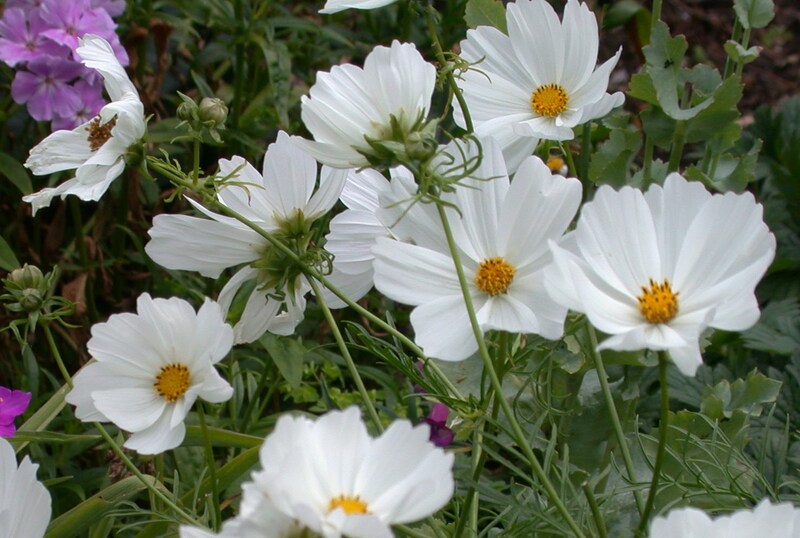 It’s at its best now and I love painting white flowers and have never really tried to paint cosmos. And as I’m down to do a late summer flower painting workshop for the Society of Floral Painters in October, I thought these might be a good subject. In a gentle breeze they arrange themselves into interesting shapes and positions which the camera can capture to make a good composition. On a sunny day the cast shadows on the petals are stunning and their pristine white petals stand out beautifully against a dark background. Anyway, I’ve been having a go today and will post the painting tomorrow when I finish it. I’ve gone straight in with a full painting. It might have been better to do some studies first…but I’m too impatient! Thank you for your cosmos; you made a very pretty picture. May I make a suggestion? The spirit of the cosmos is in its freedom and this is visually captured by seeing only a few facing the same direction at any one time. They actually dance with the breeze. You may consider a change from your usual gorgeous flowers with dark darks abutting your light flowers and see what happens. I am myself struggling with the photos of the cosmos I made last summer. Am still preferring one at a time atop a slanted stem. I’ll let you know.